Thanks to companies like CNN and NBC, we have been able to take a closer look at the wars of the present and see live action unlike anytime prior to this date. 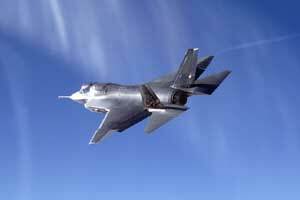 One of the major displays of power for the United States Military is air superiority. At this current point in time, the U.S. has the highest ability to control air space and utilize it to make precision strikes against our enemies. But the government is not satisfied, and has several projects under contract, to not only maintain, air dominance, but also take it to the next level. The new stealth bombers that we have come to know during the Iraqi conflicts are only scratching the surface of what is to come in the near future. However, developing new technology takes money. What is the final price going to be for research and development, and the actual cost per unit of these new planes? Furthermore, is the benefit worth the budget? In the past I believe that this has been the case, but the new planes are going to be so far beyond most all countries, is it necessary? And thirdly, once the projects are completed, how effective is this new technology going to be when fighting head to head with an enemy aircraft? When looking at the two new planes in production and experimental phases, we come across two different manufacturing strategies. Yes, both of the planes are going to require a lot of money. When browsing the web, reading the news paper, and various journals, there will be several numbers thrown out at you claiming to be the final cost of the research, development, and production of the aircraft. As we know in the past, budgets are always exceeded by the United States Military. 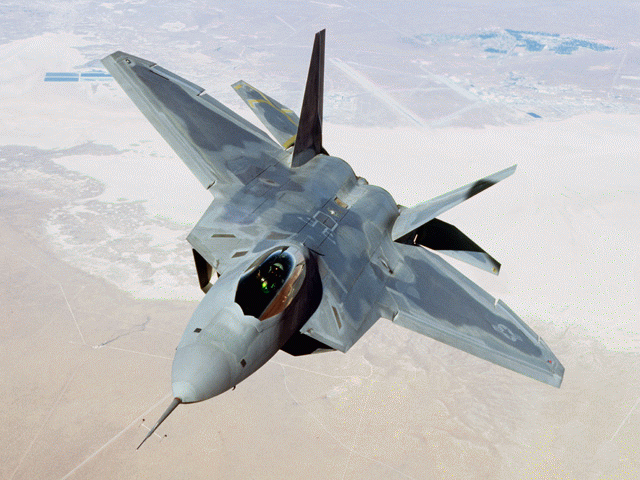 Research on the F-22 Raptor alone has exceeded billions of dollars. This new plane will offer a variety of advantages never seen before in any aircraft ever! One it will have some of the best stealth technology ever created, making the radar signature smaller than a small bird. It will conatin its own personal on board radar allowing to detect enemies over the horizon, before being deteced itself, fire a weapon, make a kill without the aircraft's presence ever being known. If a situation arrises where an F-22 does encounter another aircraft head to head, nozel thrust vectoring has been installed giving the Raptor manuverablilty unlike any aircraft ever seen before. Thrust vectoring is a lot like a jet ski, when you turn the wheel, the nozels on the back of the ski redirect the flow of water changing your course. Thus when the pilot moves the yoke he also redirects the jet engine exhaust allowing for faster more controlled turns. If such a case arrises that a surface to air missile (SAM), is fired at the F-22, this missile will typically track the plane using the exhausts heat signature, if it is short range, or by using a ground radar for tracking. To reduce the heat signature aspect, a new exhaust cooling systems has been installed making heat tracking missiles an almost null threat. The planes also have stealth as we know, reducing the risk of radar tracking SAM's. Just to put some icing on the cake, General Electric, and others, have developed engines that will allow the plane to supercruise at extremely high speeds using less fuel than any other aircraft we have today. This means longer range attacks without having to put a refueling crew at risk. You might ask if we are already dominating the skies, why the upgrades? Currently European countries are working on the Mirage 2000, which they intend to be a stealth plane that will dominate the current planes we have in service today. Furthermore, Russia and India combat against the United States' F-15 Eagle with the SU-27 Flanker. This plane is more manueverable and perhaps faster. Thanks to innovated avionics our F-15 pilots still have the edge needed to win an air to air battle. Russia is also designing a planes that are more advanced in thrust vectoring but not in stealth. These are the SU-35 and the SU-37. These also are not in the final production phase, but be sure to look for them in the near future. If the future sons of america are going to go into battle, don't we want them to have all of the advantages possible? I think so, and I am sure many people would agree. When designing the Joint Strike Fighter, the military was looking for a multi role platform that would satisfy the needs for more than one branch of the arrmed forces. The F-35 is going to do just that. There will be four different variations, one for the Air Fore, Marines, Navy, and the United Kingdom. The variations are not too complex but offer great advantages needed for each branch. 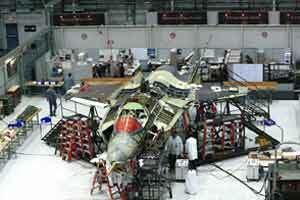 The Air Force model will replace the F-16 and more than fulfill the role that aircraft plays today. It will also replace the aging A-10 warthog, that is currently known as our tank killer. This plane is most easily recognized by the mini-gun fitted in the nose capable of delivering thousands of armour piercing rounds a minute. The U.S. Navy varient will have upgrades in the area of wingspan and landing gear integrity due to the high strain placed on those parts in take off and landing on a carrier. This plane will replace the F/A-18 E/F that many of us have become familiar with in movies like "Behind Enemy Lines" and the Blue Angels. The Marines will have more modifications allowing the plane to have short runway take offs and vertical landing seen in the harrier jet, AV-8B. The Marines are also operating some F/A-18 that will also be replaced by this aircraft. The other varients that will be sold to the U.K., and eventually Israel perhaps, will help to pay for cost and development, and further increase the survivability of the pilots representing our allied countries. When looking at the high prices we are paying for such equipment you must take one thing into consideration. The United States is building one plane that will replace a series of other aircraft. This means when production does begin it will be cheaper, more efficient, and maintaing and repairing these aircraft will also become more affordable due to the continuity in each platform. Here to fore, it would be false to say that the United States is spending money on the military without any financial planning in mind.